Found in forest streams in Thailand, Cambodia and the Malay Peninsula to Indonesia. Mature females are more plump when compared to males. An active peaceful shoaling fish which not be kept in groups of less than 6. 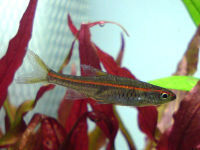 Ideally should not be kept with very slow swimming fish, nor with similar sized or larger very boisterous fish as this Rasbora can be a little timid. An omnivorous fish which should accept pellet/flake food as well as live/frozen foods such as daphnia and bloodworm. Prefers a densely planted tank with dim lighting and floating plant cover. Suitable for blackwater setups. A peaceful mid-swimming shoaling fish. An small elongated fish with a forked tail. The belly is white while the back is olive-brown with the body being brownish-grey. The fins are smoky-grey. A healthy fish develop a bright red stripe that runs from the tip of the snout, through the upper part of the iris and to the caudal fin. Looks like an elongated Glowlight Tetra (Hemigrammus erythrozonus).